Need a quick and easy cooking solution when it comes to your family? Then the new UltraPro line from Tupperware is a must for you this holiday season. Not only can you cook great meals in this pan, but it is safe for the oven, microwave, fridge, freezer and dishwasher. When I first received the pan I was skeptical on it’s ability to be put in an oven. 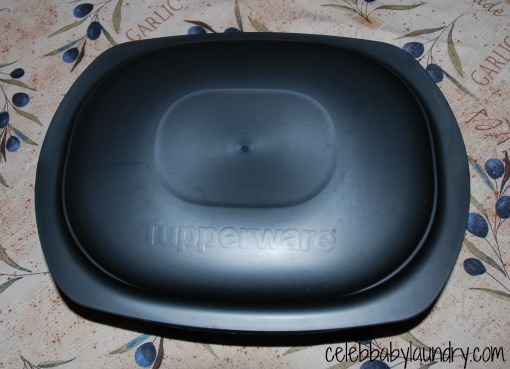 I mean it looks like Tupperware, not cookware! I decided to test out the pan by cooking an enchilada casserole inside. It came out absolutely delicious! 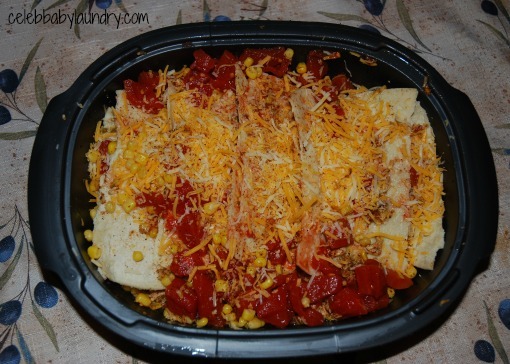 To prepare enchilada filling, place chicken, corn, 1/2 cup cheese and seasoning blend in medium bowl, stirring together. Take the pan and cover the bottom with some Mexican green salsa. 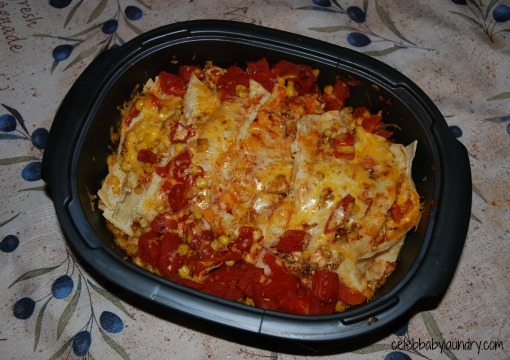 Divide Enchilada filling between tortillas and roll. Place enchiladas in the pan, folded seam down, and top with some more green salsa. Open the can of diced tomatoes and put some of the tomatoes around the enchiladas. Pour some sauce down the sides. Sprinkle remaining cheese on top. Cover and put in the oven for 15-20 minutes. * This recipe was adapted from a recipe in the Make it Modern with UltraPro Recipe Booklet from Tupperware. The convenience of this pan is unbeatable and their are endless things you can make with it. When the leftovers cooled I simply put the pan with the cover in the fridge. When the leftover were done I popped in the dishwasher! The 3.5-QT runs for $99 and can be purchased at the official Tupperware store. The Tupperware UltraPro lines comes in different sizes.